“Hack” is shorthand for a shortcut or a trick that can make your life easier. They can apply to any area of life, from cooking to cleaning to dining out. And, they are not only innovative approaches to tackling life’s challenges, but entertaining as well. We’ve taken a look around and come up with a list of hacks you can use when planning your next trip. In a rental car, look at the little icon for the gas pump. The direction the gas handle is pointing is the side of the car where you put your gas in. Put your smartphone on “airplane mode” to make it charge faster. Forgot your phone charger attachment or have the wrong voltage? Power up by plugging your cord into the USB port found on the back of most hotel TVs. Take a photo with your phone of where you park your car at the airport. That way, you can remember where your car is. Take a photo of your rental car for scratches and dings BEFORE you leave the lot. If on a road trip, take a photo of your car’s license so you have it when you register at your hotel. Can’t hear the alarm clock? Set the alarm on your smartphone and put it in an empty glass near your bed. The sound will be amplified. 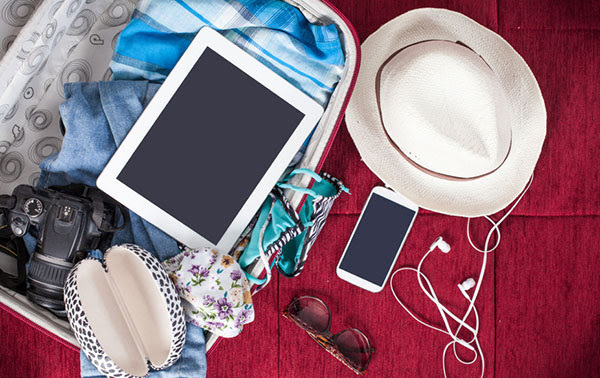 Take photos with your smartphone as you pack so you have a visual inventory of what you’ve packed, just in case your bags get lost. Take an HDMI cord to connect your laptop, phone, or tablet to the hotel TV. You can then stream your favorite NETFLIX movie, Amazon Prime or other services you might have. We are addicted to MhZ Choice for International Mysteries. Did you know you can use a shoe to open a wine bottle? Here’s how: Remove foil. Place bottom of bottle inside the shoe (works best with a brogue or something similar). Find a sturdy wall (brick or concrete) and repeatedly bang the shoe sole (containing the wine bottle) against it. Use force and expect to repeat banging motion about 20 times. The cork will eventually emerge. Smartphone + empty toilet roll = instant boom box. If you cannot do any of the above tips, please come to the lab. You can schedule either a one on one with your phone or take one of our classes. If you live in central Texas this is the best time of year. Indian Paint Brushes, Poppies and Bluebonnets to name a few are in abundance on the highways and in the pastures. Even if you have hunted down the perfect flower last year, this years crop is different. For poppies right now, Georgetown and Castroville are in full bloom. Tips on cameras- this one was taken with a phone. Get close, push your finger on the focus spot, wait and then either use a voice command or your ear buds to remotely take the snap. Roadsides just before Babyhead Mountain were covered with a mix of bluebonnets and paintbrush. This has expanded over the weekend to include all the way down to the intersection with CR-215. Farther south of Llano along Texas 16 to RR-1323 there are now numerous long stretches of roadside fairly covered with either bluebonnets or a mix. When you photograph flowers, shoot in Aperture Priority mode. This enables you to control your depth of field. When you’re shooting lots of wildflowers, you have two options: You can create a photograph where every flower is in sharp focus or where the flowers in front of the scene are in focus and the rest of the image is a dreamy blur. To create the first type of photograph, use a small aperture and focus one-third to halfway into the field of wildflowers. This ensures that the entire field of flowers will be in focus. Create a dreamy look by shooting with a large aperture (small f-stop number). Focus on the flowers nearest the camera, and the distant flowers will be a creamy blur. Use a fast shutter speed as the wind is always blowing and you can stop the action. See you in class after you go out and about and enjoy our spring.